Mare is a dark elf and one of the twin Floor Guardians on the sixth floor of the Great Tomb of Nazarick. He is the twin brother of Aura Bella Fiora and was created by Bukubuku Chagama. 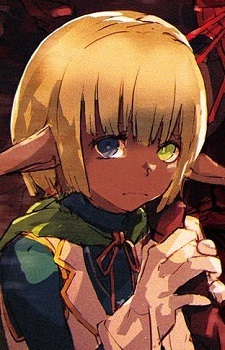 Mare is a girlish looking child with dark skin and pointed ears, a signature trait of the dark elves. He has golden hair and heterochromia, his right eye green and left eye blue. He wears a boring blue dragon scale leather covered by a white and gold vest embroidered with the sigil of Ainz Ooal Gown and a forest green-leaf cloak. Below he has a matching short white skirt exposing his skin, and on his neck is an acorn necklace emitting silver light. His slender hands are donned with shiny white silk gloves while holding a twisted black wooden staff. Mare has a shy and cowardly personality, the opposite of his sister Aura. This is due to the fact that his creator apparently believed that the younger brother should obey the elder sister. He often stutters when speaking and maintains a subservient demeanor during conversations. This, however, is only an outward guise and does not affect his loyalty to Momonga or his ability to carry out his duties, no matter how cold-blooded they may be.